EZ High MW Mouse Tail DNA Isolation Plus PCR Kit is for isolating high molecular weight, archive-quality genomic DNA from mouse tails with DNA purification. The kit utilizes a solution based salting-out precipitation method for purification of DNA. The mouse tail is digested with Proteinase K in Nuclei Lysis Solution. Contaminants such as proteins are removed by salt precipitation. The DNA is recovered by precipitation with alcohol and dissolved in DNA Hydration Solution. The purified DNA is ready for a variety of applications including restriction digestion, amplification, sequencing and membrane hybridization (Southern and dot blots). The 2X PCR Ready Mix included in the kit is specially formulated for genotyping. The enhanced formulation leads to less false negatives in genotyping. 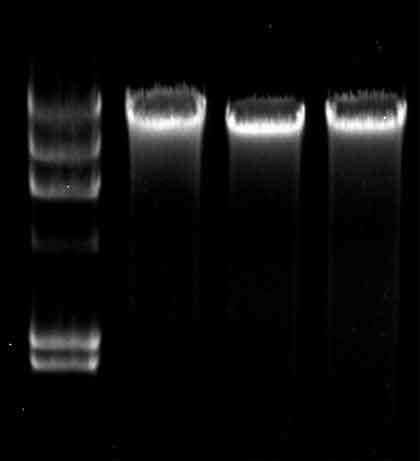 The 2X PCR Ready Mix contains an inert red dye that allows direct loading of PCR products onto agarose gels and eliminates the need for addition of loading dye.